Activists and city officials are challenging California Pacific Medical Center — which a new study shows provides far less charity care than other San Francisco hospitals — to do more for all city residents if it wants approval for the massive new high-end hospital and housing project it is seeking to build on Cathedral Hill. That $2.2 billion project, which the city will consider sometime next year, would also rebuild or modify four other CPMC hospitals in town, including St. Luke’s Hospital, which serves low-income Mission District residents, but which will see its number of beds cuts from 130 now down to 80. Community groups opposed to the CPMC project as it now stands — including the Good Neighborhood Coalition, Jobs with Justice, and Coalition for Health Planning-San Francisco — commissioned the UC Hastings College of Law to study how CPMC’s charity care compares with other nonprofit hospitals in the city. The result, “Profits & Patients: the Financial Strength and Charitable Contributions of San Francisco Hospitals,” was released Dec. 8 and was scheduled to be the subject of a public hearing at the Board of Supervisors on Dec. 13 after Guardian press time. Activists planned to use the hearing to highlight some of the report’s most damning conclusions about CPMC and its nonprofit parent company, Sacramento-based Sutter Health. “Mainly due to Sutter Health’s plan to alter its current hospital structure within San Francisco, the provision of community health benefits by San Francisco hospitals is now a major issue before the Planning Commission and Board of Supervisors,” the report reads. The report compares CPMC’s hospitals with St. Francis Memorial Hospital, St. Mary’s Medical Center (both are Catholic Healthcare West facilities), and Chinese Hospital, as well as noting how the city-run General Hospital provides by far the most charity care in town. The report finds CPMC is only spending about 1 percent of its revenues on charity care while the city sets a minimum standard of 3 percent. Even before that project, CPMC/Sutter is the dominant health provider in town, and by far the most profitable. Between 2006-2010, the report says the company made $743.9 million in profits from its San Francisco operations, compared to St. Mary’s $22.6 million in profits and the $14.8 million loss by St. Francis. “Our analysis shows that CPMC has the financial capacity to provide more of a share of services for uninsured and underinsured San Franciscans than it presently does, and that it is crucial for CPMC to do so in order to meet the city’s health care needs,” said Jeff Ugai, a Hastings student who worked on the study. In 2010 CPMC’s three oldest campuses — Pacific, Davies, and California — provided charity care at a patients per bed rate less than half that of St. Francis, even though CPMC is triple St. Francis’s size and has much greater financial stability. But CPMC, which has been resisting calls by Mayor Ed Lee and other city officials to commit to more charity care as a condition for its project, isn’t even accepting the report’s damning conclusions that it is extracting huge profits from San Francisco and giving little back. That’s not surprising given that CPMC makes more money in San Francisco than any other hospital, enough that it has become a cash cow for the entire chain. 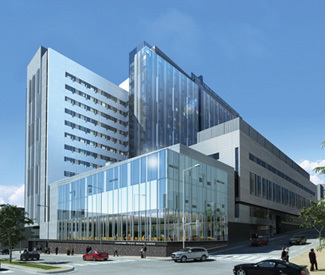 “CPMC-St. Luke’s is not only the most profitable hospital in San Francisco, but it is also the most profitable hospital in the Sutter Health statewide network. Out of twenty-one hospital groups within the Sutter Health network, CPMC/St.Luke’s brought in nearly one quarter of Sutter Health’s average net income over the last five years,” the report reads. But McCormack says Sutter reinvests its profits back into the system.